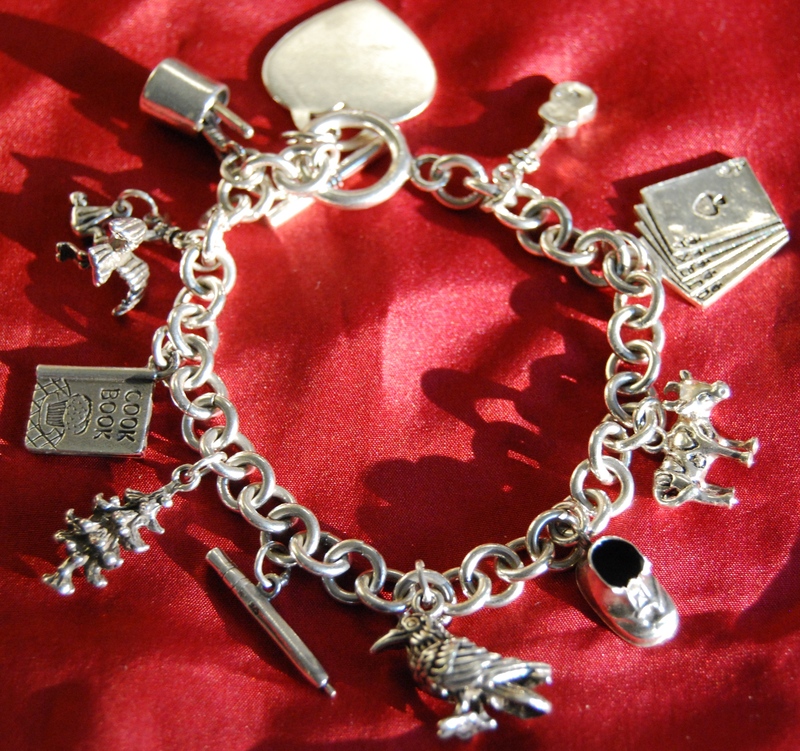 A few lovely “silver” pieces for this week’s creativity contest prompt. Our winner is Karen Winters. 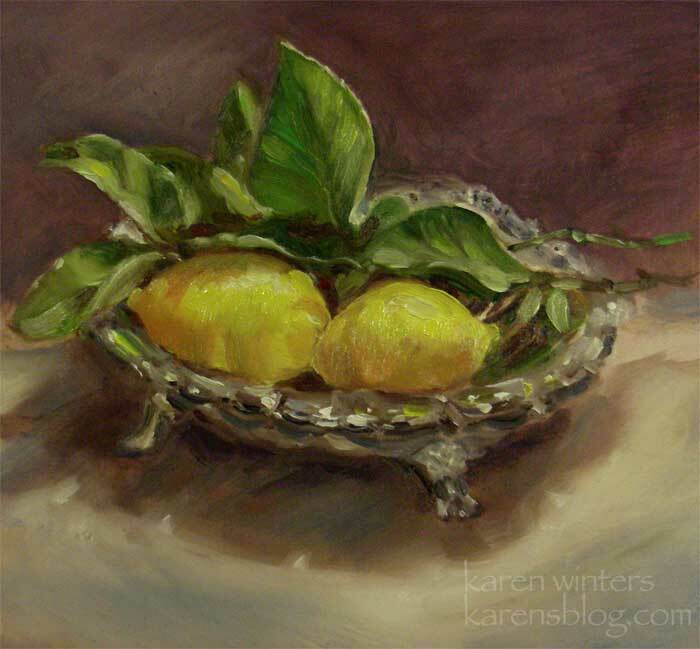 Karen writes: “When I really want to challenge myself to paint something in a realistic style, I often select a still life that includes a piece of silver or glass. We only know that something is shiny metal by the presence of reflections. And those reflections require us to look deeper and to notice the subtle color and value changes that lie in the peaks and valleys of the intricate surface. What makes an exercise like this so valuable is the process of close observation, a practice that borders on a meditative experience, and can carry over to other things that we paint as well.” Beautiful work, Karen. Your $10 amazon.com gift certificate is on its way. rising from dark to silver. Silver drops float, barely visible. Use the prompt however you like — literally, or a tangential theme. All media are welcome. Please e-mail your entries to creativereality@live.com by 10:00 p.m. eastern time (GMT -5) on Tuesday, December 2. The winning entry receives a $10 gift certificate to amazon.com. Writers should include their submission directly in the body text of their e-mail. Visual artists and photographers should attach an image of their work as a jpeg. Enter as often as you like; multiple submissions for a single prompt are welcome. There is no limit to how many times you can win the weekly contest, either. (You do not have to be a contributor to this blog in order to enter. All are invited to participate.) All submissions are acknowledged when received; if you do not receive e-mail confirmation of receipt within 24 hours, please post a comment here. Remember, the point here is to stimulate your output, not to create a masterpiece. Keep the bar low and see what happens. Dusting off work you created previously is OK too. For more info, read the original contest blog post. short and sweet this week (good timing as i’m starting the cooking blitz) and lovely visual arts! congrats, karen! Thank you very much, Miranda. I’m honored and thrilled! Oh, I see another art book in my future! karen, congratulations on a beautiful painting! I love Cathy’s abstract, but would like to know something more about it! That one’s on me — I usually follow up with Cathy J. to ask what her medium was, but this week I forgot and as I staged the blog post at the last minute (i.e., Wednesday morning!) there wasn’t time to e-mail her. Cathy, please do enlighten us! congrats, karen! another batch of great entries all around. i’ve got to get back on the stick here! Miranda, just sent you an entry for the Thanksgiving prompt!